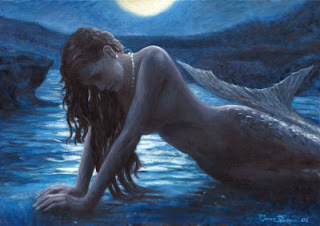 its a full moon tonight, and this would be the perfect night to see the elusive Mermaid whom youve been waiting to see all your life, also looking at the moon... the tent has a wonderful view of the moon, ive placed my comfortable chair with the best view of this gorgeous shimmering dancing light on the phosporus of the surf! i sometimes feel the strength of our family.. i have to be tough with my son...to let him have a little discipline and learn to mind..
he is so gorgeous, he will have his choice of girlfriends..
lots of things that i(we) have to do for the new year!! i have to get going on my Mermaid tale! 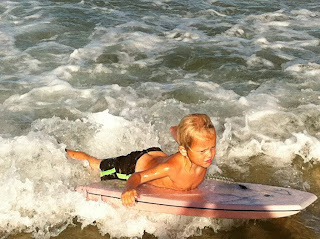 everyday with my son is fantastic lately but Im sad that I didn't get to see Colin's reaction to his bike, but he loved his body board , a hand me down present from my great american neighbor, Mark! I didn't get to see Colin stand up on the board! it was nice connecting with the other lifesavers doing a couple of hours of xmas patrol... they brought out some great food,... chicken, ham, huge prawns, potato salad.. im glad i stayed the extra hour of patrol!! now im having a nap, and wish some of this aussie heat would go your way, steve! then Colin and Angela joined in and i was so pleased to spend time teaching him to surf on the boogeboard.. he was just soaking it all in and getting involved with everything where the other children were in!! sometimes when i think things are wonderful, it all just seems to fall apart..
i couldnt resist writing about the sunday surf swim... I felt good in the water, but the handicap was too severe after the chairperson decreased most of the backmarkers by 1 minute , essentially increasing my own handicap start 1:15 over other competitors. The race was fun though with the harder challenging waves! so the young very strong teenage swimmer, Sarah, took off 45 seconds ahead guaranteeing her another 1st place for the year but with a very low starting time. Cale was finally able to place in the sunday race being also a benefactor of the very subjective chairman. The results were snatched away quickly before I might be able to examine the times that are always discreetly missing when posted on the bulletin board. Hopefully they will be posted tomorrow so that I continue to inform about the race! its after 420 in nsw time, but unfortunately we are in qld because they dont believe in daylight savings time, so the sun will set in only about 3 hours during the longest days of the years... i have to program myself to get up early and then take a nap at 8 or 9am without drinking the coffee!! the surf was the biggest and wildest since arriving here in Oz!! 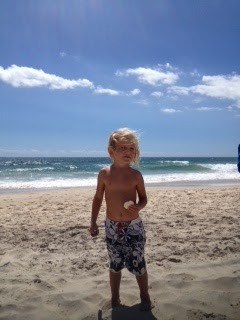 in front of our home and then body surfing!! what a wonderful backyard playground! or at least as far as ive been! can we say lucky or blessed? Sunday's short race was confusing with all the swimmers in the water working on their bronze and proficiencies! After being excluded from the race, I had to hear about the race from several competitors, while anxiously waiting to be judged at my lifesaving competencies half an hour later..
3/3rds of the previous surf administration were medalists../. after almost 2 months my handicap(time we start after 0) has come down to 6 minutes... when my handicap reaches down to 530, i should have a chance of at least winning 3rd with at least a cup of coffee! the rules or times can be corrected (fudged) at the chairman's discretion . but often swimmers will lay off a year , so that they somehow are forgotten and manage to start the year with a very unfair handicap to their advantage. This would give them a 45 pt advantage before others that were given unfair disadvantages come down to a more competive time. all finishers should come within 1 minute of each other if the race was fair.